Grant Villa is a light-filled 1970’s home with updated decor complemented by modern furnishings. 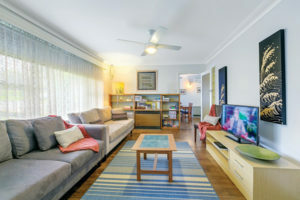 The perfect place to unwind is the large, comfortable lounge room with a big flat-screen TV and huge windows looking onto the front rose garden. The spacious retro kitchen is fully equipped and features modern appliances and an enormous walk-in pantry. The dining/sitting area includes a second TV viewing space. Effective gas heating in the living areas is complimented by electric heating in the bedrooms, keeping you warm and cosy through Ballarat’s winter months. The kitchen/dining/living space also has air conditioning. 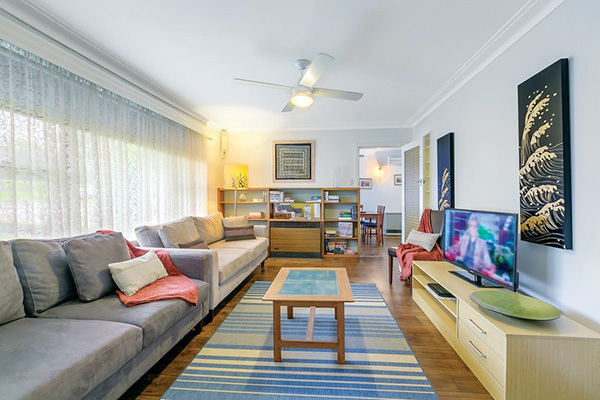 Unlimited NBN wifi and pay TV is conveniently included with your stay. The carpeted bedrooms are all large with restful garden views; two of them feature big walk-in wardrobes – giving plenty of storage space for longer stays. There bedding configuration is: 1x queen bed; 1x queen and 1x king single; 2x king singles – this allows everyone to have a larger bed when colleagues are sharing. Of course, all bedding, linen and towels are included. You will find electric blankets and quality linen on all of the beds to ensure a good night’s sleep. The updated bathroom features a big walk-in shower and plenty of space, the toilet is in the bathroom. The full sized laundry has both washing machine and dryer. Outside there is a large, secure back yard with alfresco dining setting. The fully fenced backyard is suitable for pets – subject to approval when booking. The front rose garden provides delightful views from the living areas and two of the bedrooms. There is off-street parking for 3 cars (two under the tandem carport); and plenty of on-street parking for larger vehicles.